The Royal Botanic Garden at Edinburgh is conducting a taxonomic revision of the genus Ficus in Africa, correlated with a study of the genus on a world-wide basis including the Arabian Peninsula. Much more material than it presently possesses is therefore required by the Herbarium for study. Even the common species are not well understood and fully annotated collected specimens are very welcome. 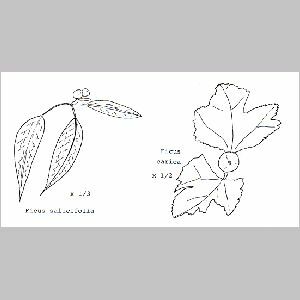 Two native species of Ficus have so far been identified from mountainous terrain in the UAE and Northern Oman: Ficus carica L. and F. salicifolia Vahle. Others might very well exist, such as F. pseudosycomorus (syn. F. palmata) which may easily be confused with F. carica. As a generalisation F. carica is a tree found at higher elevations and has hand-like lobed leaves and a fruit which is a recognisable fig shape. F. salicifolia is a larger tree found at lower elevations in wadi beds among boulders, and has willow-like leaves and a fruit resembling a small spherical berry. Not all of the following hints from the Edinburgh Herbarium may be applicable to local Ficus species. -Ed. If specimens can be dried very rapidly by artificial heat it will be found that the leaves have less tendency to detach from the twigs. Alternatively, it is suggested that material may be dipped in paraffin (kerosene). A paraffin tin cut in half makes a convenient container. Immersion for about a minute should be sufficient to kill woody material. Specimens may subsequently be left in the press for two to three days without damage. 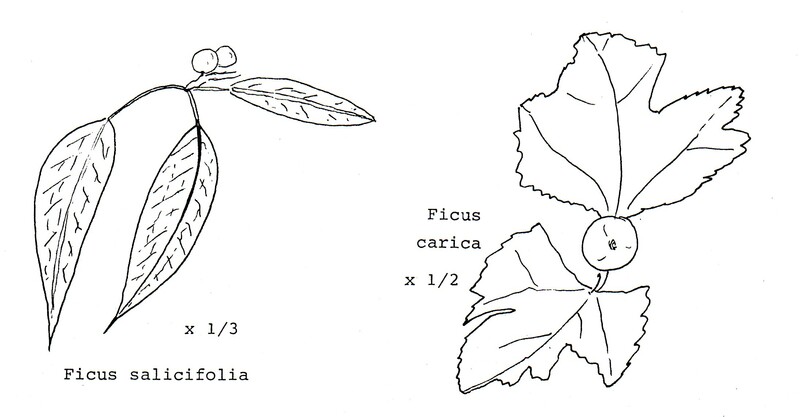 Figs should not be sectioned if it can possibly be avoided; the result is not of great assistance to the Herbarium. If necessary a fertile twig may be dried separately without pressure or, preferably, be preserved in spirit. Specialised, leafless, fertile branches may also be treated in the same manner if necessary. 1. Every specimen should include representation of the full range in size of mature leaves on the plant. Especially as regards the species with rough surfaced and wavy-, serrate-, toothed-, or lobe-margined leaves (Nos. 1 -24 of the Flora of Tropical Africa) specimens should be exceptionally full, so as to show the complete range of size and shape of the leaves on a single plant. Young (immature) twigs should be included so as to show pubescence, if any exists, and the size and shape of the stipules surrounding the growing terminal bud. Where possible, fruiting specimens should be accompanied by twigs and leaves from sucker shoots, fruiting or sterile. d) any combination of these. The colour and diameter of the figs should also be noted. It would be useful if a few figs could be preserved in Ispirit. Immature fruits should be correlated with mature fruits where possible. 3. Where possible, the habit of the plant should be fully detailed (rhizotamous shrub, epiphyte, free-standing tree etc.). Particular attention should be paid to free-standing trees to determine, if possible, if the tree began life as a seedling in the soil or as a fence stake (and, therefore, has a true trunk) or whether the trunk is a false one, built up by the coalescence of the aerial roots of an Iepiphyte, whose host has since died. The attitude of the branches (steeply ascending, spreading or drooping) should be noted. It should be noted whether the leaves are clustered at the ends of the twigs, and shed annually, or whether the leaves persist on older wood, and the trees remain essentially evergreen. 4. The habitat of the plant should be noted. Is it found, or planted, around local dwellings? Does it occur naturally in evergreen or deciduous forests, or in riverine fringes, or in scattered tree grasslands, or in scrub? What is the approximate rainfall in the area, and what is its seasonal distribution? What is the approximate altitude? 5. Any additional comments, particularly about relationships between collections will be very welcome. Much that is obvious to the field worker is not obvious in the Herbarium. The present reviser is only too well aware of his own limitations, and will welcome correspondence, and disagreement, about his conclusions.